Remove the cover from the roasted peanuts. Grind it and keep it aside. You can keep some whole roasted peanuts for garnishing later. Heat oil in a pan and add the cumin seeds. When the seeds start spluttering, bread the dry red chillies in two halves and add it in the pan. Then add the chopped onion, ginger and garlic and stir fry for couple of mins till the onions become soft. Add the chicken pieces to the pan and mix well with the onions and cook for 3-4 mins till the chicken become light brown. Add the chopped tomatoes, chilli powder, turmeric powder, cumin powder, coriander powder and salt and mix well with the chicken. Lower the heat and cover the pan and cook for 10 mins till the chicken become tender. The chicken and tomatoes will leave water so do not add any additional water. Remove the cover from the pan and when you see that is chicken is nearly cooked and the oil starts separating from the gravy, add the peanut paste and fry for 3-4 mins. The peanut absorbs all the water, so that this point of time, add a cup of water and simmer for 5-6 mins. Serve hot garnished with roasted peanuts and Coriander or Mint. 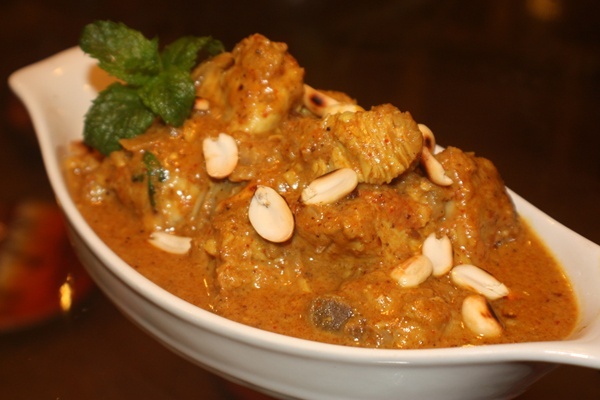 This entry was posted in All Recipes, Chicken and tagged Peanut Chicken Curry by Kamakshi. Bookmark the permalink.